Will I enter the 2019 Medicare Part D Coverage Gap or Donut Hole? If the retail cost of your medications is over $319 each month, you will enter the 2019 Donut Hole or Coverage Gap. As a reminder, you will enter your Medicare Part D prescription drug plan's Donut Hole or Coverage Gap if the total retail value of your formulary prescription purchases exceeds your plan's Initial Coverage Limit -- and the 2019 standard Initial Coverage Limit is: $3,820. For example, if you use a formulary medication that has a retail cost of $375 and you pay only a $60 co-pay with your Medicare Part D plan, your Medicare plan will pay the remaining $315, but the total retail cost of $375 counts toward meeting your Initial Coverage Limit or entering the Donut Hole - and if your average monthly retail drug costs are $375, you will enter the 2019 Donut Hole or Coverage Gap in November (see chart below). Remember ... the retail drug cost of your medications is usually not what you actually spend for your prescriptions, but what is spent by you plus what your Medicare Part D plan pays (or others pay on your behalf). And your Medicare plan's monthly Explanation of Benefits (EOB) letter will not state "Retail Drug Cost", but instead, your EOB will state "Plan Paid" and "You Paid" - and added together this is your plan's negotiated retail drug cost. Where else can you see retail drug price information? Both our Formulary Browser (showing all drugs for a single Medicare plan) and our Drug Finder (showing all Medicare plans covering a single drug) include CMS formulary data and average retail pricing information. For more information, our Retail Drug Pricing Detail pages show the pricing history for each medication (when available). As noted, our retail drug pricing information is the average price across all pharmacies in a specific region and actual retail drug costs can vary slightly at your specific pharmacy. You can also telephone your Medicare plan or a Medicare representative (1-800-Medicare) for retail drug price information. The good news: If retail costs of your prescription have not changed since 2018 (which is unlikely), the 2019 Donut Hole or Coverage Gap should start just slightly later since the 2019 Initial Coverage Limit ($3,820) is slightly higher than the 2018 Initial Coverage Limit of $3,750. In other words, you will be able to purchase slightly more prescriptions before entering the 2019 Donut Hole as compared to 2018. For example, if your average monthly retail medication costs were $400 in 2016, you entered the 2016 Donut Hole in early-September 2016. However, if your costs remained the same the next year, you entered the 2017 Donut Hole sometime in early-October 2017. 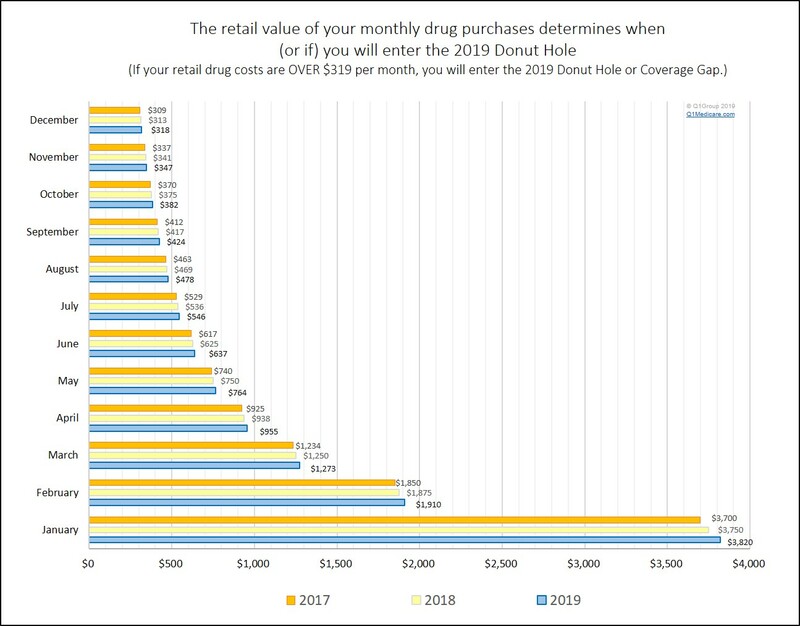 Based on the same $400 average monthly retail drug cost, you entered the 2018 Donut Hole mid-October and you would enter the 2019 Donut Hole late-October. If you receive Medicare Part D Extra Help or Low-Income Subsidy (LIS), then you will never enter the 2019 Donut Hole and the cost of your prescriptions will remain constant until you reach the Catastrophic Coverage portion of your Medicare Part D plan where your drug costs may actually be reduced depending on your financial resources. And if you are qualified for your state's Medicaid program, you are automatically qualified for Extra Help. If you are purchasing Medicare Part D drugs with a retail cost of over $319 per month, when will you enter the 2019 Donut Hole or Coverage Gap? The chart below shows the monthly retail drug costs that would cause you to enter the Coverage Gap or Donut Hole for any given month. the Donut Hole in . . .
costs are over . . .
Bottom line: If the retail cost of your medications averages over $319 each month and you are not eligible for Extra Help, you will enter the Donut Hole some time during 2019. "The 2019 Donut Hole Discount increases (... and what this means to you)"
You can also use our 2019 Donut Hole Calculator or PDP-Planner to get an idea of how you can budget for 2019 drug costs. The following link is for an example of a person with retail brand-name drug costs totaling $800 per month: https://q1medicare.com/PartD-PartDCoverageGapCalculator2019.php?pgtype=ex1 you can adjust the example and drug mix to estimate your actual out-of-pocket costs.